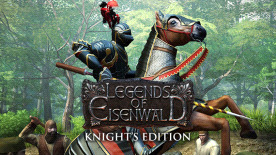 The Knight's Edition contains Legends of Eisenwald OST in MP3 and FLAC formats and artbook. The last two screenshots above in the carousel are from the arbtook. Legends of Eisenwald is an adventure game with tactical battles, RPG and strategy elements. Take the lead of a small feudal army and try to defend your right to survive in this ruthless medieval world. The mysterious lands of old Germany are waiting for you - it's a land where the superstitions of the time have come to life. This isn’t a fantasy game. There are no elves or dragons here. There are only people - and their passions, sins and fears that often take a tangible form. Which path will you choose? Live according to your conscience? Or live by power and might? Or will you live by justice? And what is your justice, really? WARNING: AFTER MANY CHAPTERS OF THE MAIN CAMPAIGN YOU WILL BE TAKEN AWAY YOUR ARMY, INVENTORY AND GOLD SIMILAR TO GAMES LIKE HOMM3 OR DISCIPLES 2. Over 50 hours of gameplay within the game. A main campaign consisting of eight chapters plus two additional scenarios.